The Rhinelander Cafe & Pub today in downtown Rhinelander. The question of immigration and people from other countries seeking a home in the United States is often in the news today and it is unfortunate that this question is often depicted in terms that invoke feelings of fear and trepidation. Every person outside of members of the First Nations is descended from an immigrant family, and it is worth remembering how immigrants gave us many of the things we take for granted today. In Rhinelander, for example, a familiar Brown Street landmark is here for residents to enjoy today because of the work of an immigrant family. Michael Vlahakis was born in the village of Kalavryta in the Peloponnese region of Greece in 1875. In 1895, when he was 20 years old, Vlahakis and other members of his extended family made the arduous journey to the United States in search of a better life. Like many immigrants of the time Vlahakis found work with the railroads, and for the next ten years he worked in the American West as a railroad laborer in Arizona and Wyoming. By 1905 he had saved enough to leave the toil of railroad work. Vlahakis returned to his home village in Greece, got married, and returned immediately with his wife Mary to the United States. The couple settled in Chicago and used the remainder of their savings to open a restaurant. The restaurant prospered, but the big city life was not what the young couple from a small village in Greece wanted. Therefore, in 1912 they sold the business and moved to the Northwoods of Wisconsin. For the next six years Michael and Mary Vlahakis lived in Ironwood, Michigan, Hurley, and finally in Ashland. In each of those locations they operated a restaurant. In 1914 Michael’s brother William decided to try his luck in the Northwoods as well. He moved to Rhinelander and purchased a restaurant on North Brown Street called the Rhinelander Café. William Vlahakis ran the Rhinelander Café for four years, but the influenza epidemic of 1918 did not spare the Northwoods and William Vlahakis was one of its victims. After William’s death, Michael and Mary Vlahakis moved to Rhinelander and took over operation of the Rhinelander Café. They made Rhinelander their permanent home and together ran the Rhinelander Café until 1953 when their son Peter took over the business. Michael Vlahakis passed away at the age of 80 in 1955. 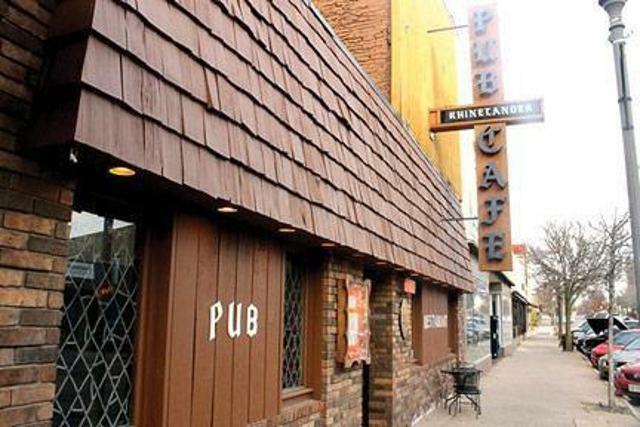 The Rhinelander Café and Pub still operates in downtown Rhinelander and is a testament to what immigrants, when given the chance, can do.